Calling All Judy Blume Lovers! How cool would it be to not just publish a number of successful children’s and adolescent novels but then turn one into a major motion picture with your son as the director? No, it’s not me; I’ve got to work on publishing first, not to mention raise my kids. 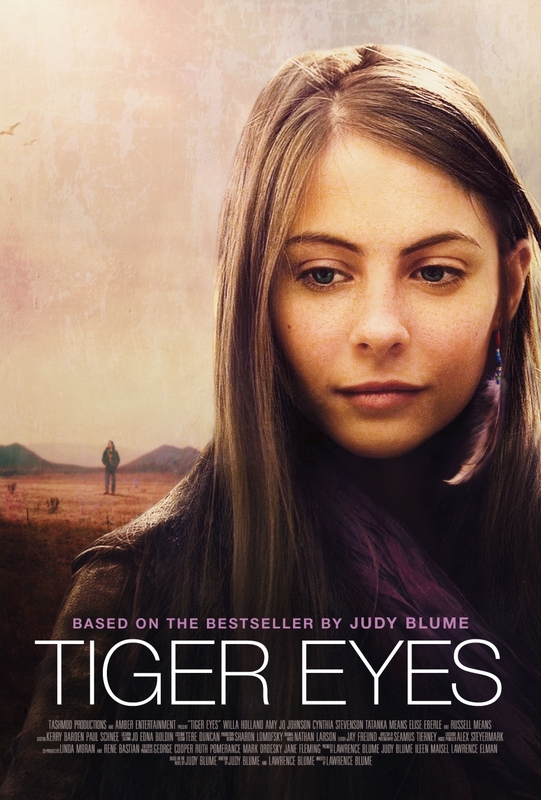 I’m talking about author Judy Blume and her novel-turned-movie Tiger Eyes . When I heard about this movie, I automatically remembered Tales of a Fourth Grade Nothing , the first of Blume’s Fudge series and the book that introduced me to the fictional world of Judy Blume. And although I get very nostalgic when I think about it (my second grade teacher read it to my class, and the fourth grade was in the very distant future at that point), I’m ashamed to say I never bothered to return to Blume as a teenager. I had no idea that she wrote for adolescents, too. When I took a course on adolescent lit a million years ago, I learned that this genre is important because it connects with teens on issues that matter to them. And while teens might enjoy adult lit (I certainly did) and adults certainly do love a lot of the adolescent books that are out there (yep), it’s important for there to be books that directly relate and speak to that age group. A regrettably under-addressed issue for teens is how to deal with the death of a loved one. We prepare kids to “Just Say No,” but who wants to talk about death, anyway? It’s so morbid. But that is just what Judy Blume does with the protagonist of Tiger Eyes, Davey Wexler. I won’t be spoiling anything by telling you that Davey’s father is murdered in his 7-Eleven store; you can read as much on the back of the book. The story is about what happens afterward, how Davey and her family deal with his death, how they figure out how to live without him. Judy Blume told this story over thirty years ago; the book was actually published before I was even born. From the preview, I can’t tell if the movie will be set in the early ’80s or not. It’s one of those things that doesn’t matter all that much in reading the book; the only clue is the occasional mention of The Grateful Dead or other popular ’80s musicians. (And, I suppose, the lack of iPhones, texting, and Facebook.) The point is, though, that Davey’s story could be the story of any young girl, and it could be set in any time. I’m looking forward to seeing how it will be portrayed on-screen. The book is narrated first-person present. I’m not sure if Willa Holland, as Davey, will provide narration throughout the movie to convey that same intimacy, but I do know, from Blume’s account in the Special Edition publication of Tiger Eyes that Davey is in every scene. I also know that there will be extra scenes not included in the book and that there were scenes that they shot that just didn’t work. That’s the nature of filmmaking, as it also is with novel-writing. If I were fortunate enough to be able to have a movie made of one of my books a number of years after publication, I imagine that I would take that opportunity to work in whatever I might have thought of in the intervening years, the extra little tidbits that hadn’t occurred to me until after publication. And Blume was fortunate enough to be able to be on set every day, working right next to her son Larry, the director. The problem with so much popular adolescent fantasy fiction-turned-movies is that excellent stories like this one kind of get shoved to the back burner. As an independent film with a small marketing budget, the filmmakers have reached out to sympathetic writers like me to spread the word. So if you haven’t already, read the book. Then, on June 7th, see the movie. It’s showing in select theatres, and it’s also being simultaneously released on DirecTV, iTunes (pre-order here), and On Demand. Meanwhile, you can watch the trailer, read Entertainment Weekly’s write-up, like the official Tiger Eyes movie page on Facebook, and follow it on Twitter. This entry was posted in Book Reviews, Odds and Ends and tagged DirecTV, Entertainment Weekly, iTunes, Judy Blume, Tiger Eyes, Tiger Eyes Movie, Willa Holland.